Columbia Records press photo for Domino Theory. 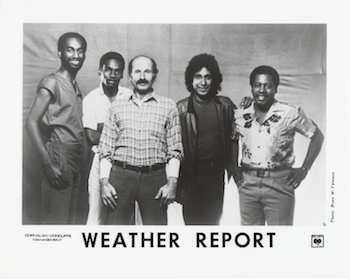 Left to right: Hakim, Bailey, Zawinul, Rossy, Shorter. Photo: Bruce W. Talamon. Columbia Records ad for Domino Theory. Domino Theory was the second album for the Hakim-Bailey-Rossy rhythm section, and Josef Zawinul spoke enthusiastically about it in the March 1984 issue of Keyboard magazine. Willie Tee (Wilson Turbinton) was a pianist, singer and songwriter from New Orleans who Zawinul befriended when he was a member of Cannonball Adderley’s band. Tee’s brother Earl, a saxophonist, performed on Zawinul’s 1971 eponymous album. Ironically, Willie Tee passed away on the same day as Zawinul, September 11, 2007. (Earl died the previous month.) Both Willie and his brother lost their homes in the devastation of Hurricane Katrina in August 2005. Weeks later, Willie joined Zawinul for a benefit concert called “Charity Event for the Lost Children of New Orleans” at Joe’s Vienna club, Birdland. Photographs from the event can be seen here. More background about Joe’s relationship with Willie Tee and other New Orleans musicians can be found in my article, “Joe Zawinul’s New Orleans Connection”. Willie Tee’s own version of this composition can be heard on the compilation album Keys To The Crescent City. A concert staple of later versions of Joe’s post-Weather Report band, The Zawinul Syndicate. A live performance by the Syndicate can be heard on 2003’s Vienna Nights: Live at Joe Zawinul’s Birdland. As mentioned above, Joe stated that his son, Erich, named this song. Billboard chart peak: Jazz Albums, 5; Top 200 Albums, 136. I have loved this album since its release back in the mid 80s, Omar Hakim’s drumming still sounds stellar. Most of the tracks were performed live at their memorable Glastonbury Festival set in 86. ‘Domino’ is on heavy rotation this week. Check out Wayne Shorter’s terrific sax work on the ‘brooding’ Blue Sound-Note 3. Better versions of these tracks can be found on “weather report live in cologne 1983”. Db Waltz and Blue Sound-Note 3 sound much better on that particular release.